New Book Helps The Building And Construction Industry Win More Business Online | Choice Digital | Results-driven seo and website conversion. Written by Choice Digital’s founder, Andrew Ludlam, this month sees the release of the first ever online marketing book written specifically for the building and construction industry. Called “Trade Up Your Online Marketing”, the book reveals the latest internet marketing tools and techniques needed in 2017 to help companies get found, build trust and win more clients online. It is now available for purchase through the Amazon Kindle Store. With hundreds of new buildings and home improvement companies launching websites each week, and thousands more fighting it out on social media and consumer websites such as Checkatrade and MyBuilder for leads, the ability to get found online by the right customer, at the right time, is more important than ever before. 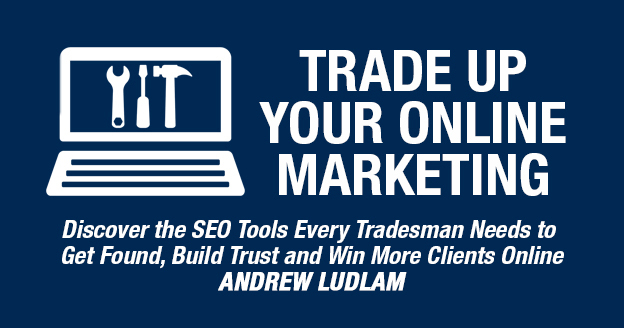 Packed full of practical and easy to implement advice, “Trade Up Your Online Marketing” is the first book of its kind written specifically to help tradesman win more business online. From builders to electricians, bathroom installers to plumbers, roofers to landscape gardeners, “Trade Up Your Online Marketing” explains – using simple and easy to understand language – the latest internet marketing tools and techniques needed in 2017 to improve their websites rankings on Google and other search engines. The book also gives every reader the opportunity to claim a free website audit – worth £129 – to see how well their company website is currently optimised for the search engines, and the first step towards to helping them gain more business from their website. Many of Choice Digital’s clients work in the building and construction trade, from small firms to national names. And whilst they all know how important it is to make sure their website comes out top on Google, they also realise that trying to make effective use of search engine optimisation and internet marketing can be difficult and confusing. With the continued surge in the use of social media, new websites appearing every day and Google reportedly changing its search rules around 500 to 600 times each year, being found on the web has never been tougher. Therefore, Andrew was keen to write an internet marketing book specifically to help tradespeople succeed online. Regardless of which buildings or home improvement sector they operate in, using the advice and guidance in “Trade Up Your Online Marketing” every trades person now has the very best opportunity – and practical knowhow – to ensure their website gets found, builds trust and wins more customers online. “Trade Up Your Online Marketing” is now available for purchase in the Amazon Kindle Store.